Home News Kansas Tax Hikers Take Note, France #1 in Taxes. A day after the President of France, Emmanuel Macron, backed down from introducing a climate change-inspired fuel tax increase, the Organization for Economic Cooperation and Development released its figures on taxes among its 36 member nations. Guess what? France edged out perennial winner Denmark to take first place as the most highly taxed nation in the developed world. 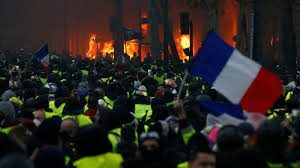 As anti-tax protests rage across France, proud tax hikers in Kansas, beginning with Governor-elect Laura Kelly, might want to consider their affection for raising taxes and demonizing those who resist. Will Kansas prompt its own yellow vest movement? Numbers published on Wednesday suggest why some 84 percent of the French population supports the “yellow vest” rebellion against the proposed carbon tax hike on diesel. Government tax revenues in France ate up 46.2 percent of economic output, up from 43.4 percent in 2000. The notoriously over-taxed Denmark came in a close second with 46 percent of its gross domestic product consumed by taxes, a figure that has remained close to constant over the last two decades. Although this may come as a surprise to the Democrats and the media, the government’s share of America’s GDP actually increased this past year, but this was due to a one-time tax on accumulated profits earned by American companies overseas. That said, including taxes collected at state and local levels, the United States ranked sixth from the bottom in overall tax rates. Tax demands in the United States this past year consumed 27.1 percent of the GDP. Kelly and the media have done an excellent job persuading a distressingly high percentage of Kansans that raising taxes is a good and moral thing and cutting taxes is reckless, if not downright cruel. The people of France are reminding the world that the concept of generosity does not including spending other people’s money.